Sometimes it just doesn't pay to plan out a Trek. Originally, looking at the weather, I figured that I wasn't going to be going anywhere these off days. It was either going to be sunny or rainy with nothing in between. My first day off was pretty busy with family and I don't even remember what the weather was. The second day, there was about a 30 minute window that would have worked. I used that day to be with family and do some resting from the previous week. My last two days were supposed to be rainy and sunny respectively. I checked the weather before going to bed Saturday night and there was rain until about noon and it switched quickly to sun. This was not going to work at all. I planned on staying home and getting some more things done around the house. When I woke up, I decided to check the weather again...just to make sure. The rain was still in the forecast, and was actually raining when I looked at the weather. However, it was supposed to taper off in the late afternoon and have some partly cloudy conditions before transitioning into full on sun. Hmmmm, the end of a weather front is usually a pretty good time to get out and enjoy a dramatic sky. Pretty much at the last minute I decided to head out and try some pictures. My two options were either Roaring Fork Falls in Little Switzerland, or Doughton Park where I know of a few trees that I really enjoy photographing when the sky looks good. By the time I got to 77 I had decided to forego the waterfall in favor of doing some landscape work. 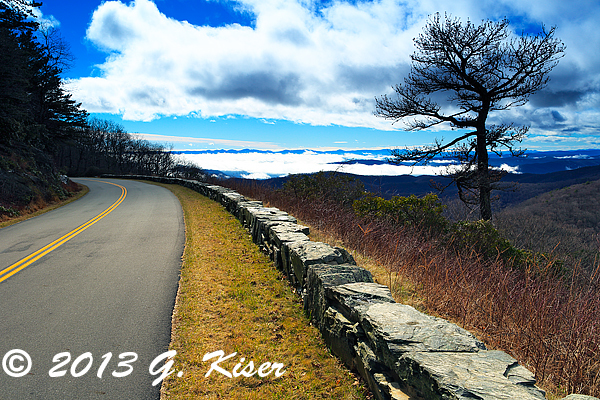 As I arrived on the Blue Ridge Parkway, the clouds were already breaking up, and I could see crisp blue skies behind the clouds. This was just what I was wanting for my intended subject. Everything was going great. We all know, however, that things rarely go this smoothly when I am trying to do my photography. This was no exception. After just a handful of miles I saw a sign that advised that the Parkway was closed ahead due to snow and ice. Uhhhh, it was nearly 50 degrees and there was no signs of any winter weather on the ground. Be that as it may...the Parkway was closed ahead, and I was pretty sure I wouldn't make it to Doughton Park. As I was traveling South, I happened to look over to my left as I rounded a bend. I remember saying to myself something along the lines of "Holy crap, that's beautiful!" I was torn....continue on to Doughton, or stay and try to photograph this scene despite the fact that the sun was up pretty high in the sky and the exposure was going to be rather difficult. I opted to continue on in hopes that I could make it to Doughton before the road closed. Nope....I missed it by about two miles. 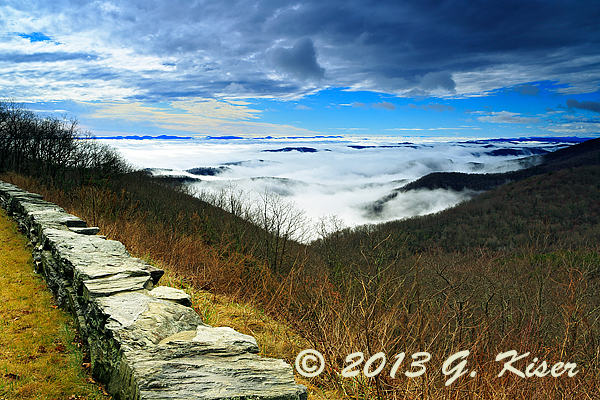 I quickly turned around and decided that my misty Roaring Gap was going to be my plan B. I found my vantage point and was happy that nothing had changed while I had been driving. That's not to say that what I saw in front of me was going to be easy to photograph, but it could have been much worse. As it was, I was shooting into the sun almost which is just not a good idea this late in the morning. I knew that I was going to have to control the sky in the exposure, and figured that the best way to do that was to go ahead and fit the Lee Filter System to the front of my 24-70mm lens. I added a 3-Stop Hard Edge ND-Grad and found that the fog was still rather hot in the valley. To control that, I added a 2-Stop Soft Edge ND-Grad and placed it lower. I now had 5 stops of light control on the sky, and between 1-2 stops on the low clouds. That seemed to work, and brought my broken histogram a little closer together. 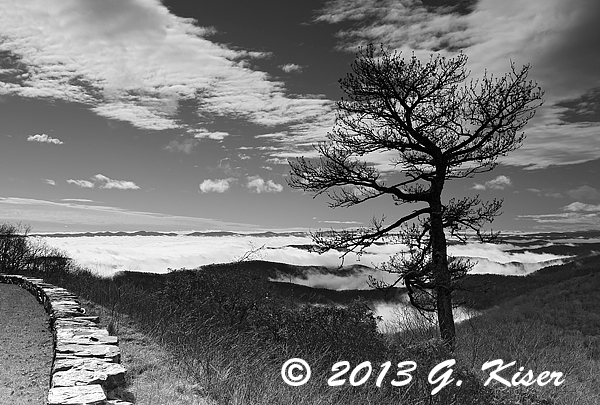 The high contrast of the scene allowed me to play a little bit with some monochrome images. These are always a nice choice when there is a full range of tonal values with good separation between them. I actually had several that I previsualized as black and white images. When I got home, I was very pleased at how this worked out for me. I stayed at this scene for probably an hour working on slightly different compositions and exposures. The main part was waiting for the sun to get covered by the passing clouds so as not to blow out different areas in the frame. It wasn't easy, but the really good landscape images rarely are. I was still rather upset about not being able to go to Doughton Park, and I was still wanting to photograph some more trees. I decided that since I still had some time, and I wasn't sure exactly what I had on my memory card, I would drive around on the Parkway for a little while and see what I could see. Ironically, I happened by a field of trees that were almost white and were completely bare of all leaves. I wasn't sure if I could make this a good composition or not, but I filed it away in my head as I continued on in search of something else to work. As luck would have it, I found nothing else going North, and decided that I had better start working my way home. I returned to that field before I left the Parkway. I have to admit, I had fun with this field. The light was doing some pretty cool things as the clouds passed by overhead. One minute the trees were all muted, and the next the white ones would pop out against the evergreens in the background. There was an infinite number of shadow/highlight combinations playing out in front of me. I just stood back and waited until the scene was "painted" as I wanted. It didn't take long to get a good many images from this location. After maybe 30 minutes or so, my battery was showing nearly drained so I took that as my clue to pack up and head home. Of course, I do carry spare batteries and had a fresh one in the camera before it even made it to the bag. It was time to head home, the clouds were pretty much gone at this point, and I was out of options on the Parkway for what I was in the mood to photograph. I made my way down the road and passed Roaring Gap headed to US 421. My mind was haunted by a sight that I had seen on the way out to the Parkway a few hours before. 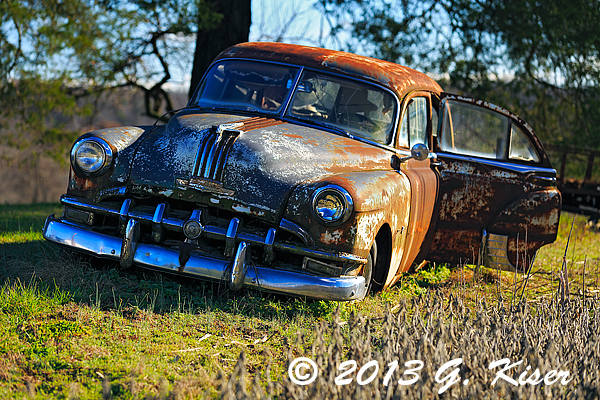 There was a '40's vintage sedan atop a hill that I had seen from the highway. Thanks to my phone, I was able to pull up a satellite map quickly and pinpoint what road it was off of, and I was able to find out how to get to that road. I decided that I had a little bit of time to work with, and even though the lighting wasn't the best, I would head out there and scope the old car out. 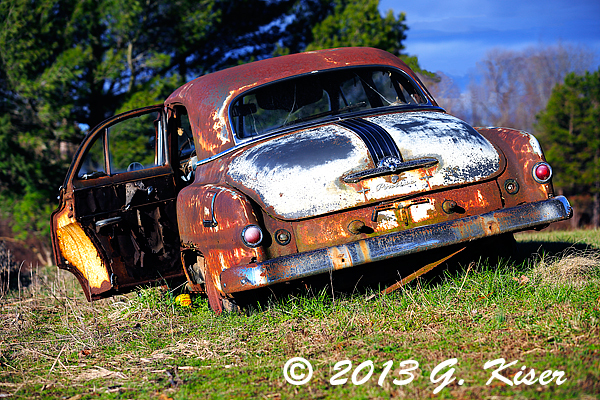 I found the old car, and quickly determined that the house that it was behind was unoccupied. With no property owners to consult, I decided to get a closer look, without doing any damage to the property. I have to admit, this car was very cool, and I had a lot of fun playing with it. I was really hoping that the few clouds that were moving across the sky would do me some favors, but it seemed that as they got close to the sun, they would just dissipate, leaving the scene awash in late afternoon light. I decided to stick with it, and I swapped my 70-200mm telephoto to help isolate the car from the surrounding clutter. That is the real hallmark of this lens, and one of my favorite uses for it. I was able to work several different compositions where I constantly battled the sunlight. While I was able to work quite a few different compositions on this car, I think my favorite image was a detail shot from the hood. There are just times that there is a particular detail that just screams for some attention from the camera. 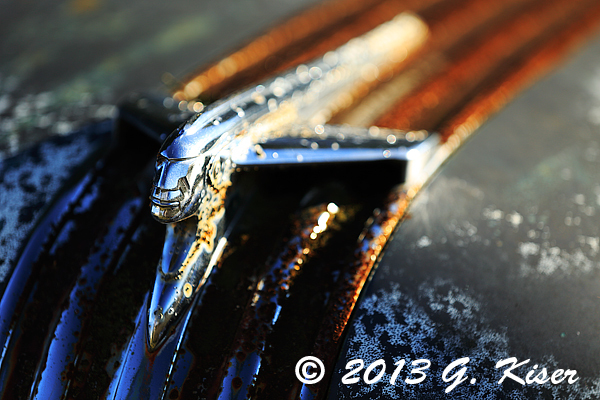 The hood ornament was just one of those details. Having developed an eye for limited depth of field on this car (again to reduce the clutter), I carried that on to the hood ornament. 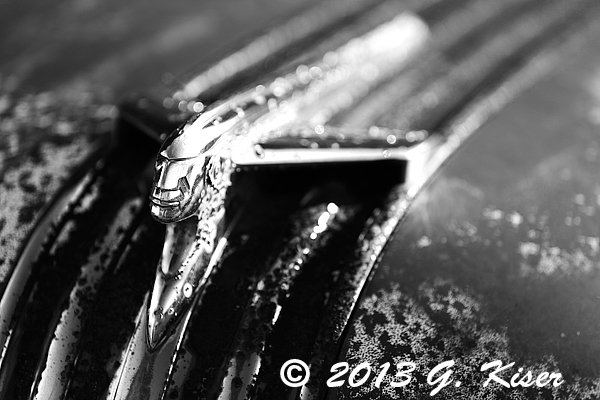 As I was walking past the front of the car, it just hit me...exactly how I needed to photograph the automotive jewelry. Honestly, I'm not sure which of these images I prefer. I do know that they represent my favorites from the whole day. Funny how I can photograph grand landscapes, ethereal trees, and a rare example of a vintage Pontiac, but find so much enjoyment out of an image that represents about 15 inches of a hood. I guess that is the magic of photography...its all in the details. Well, this was my last day off of work before going back in. I needed to get my oil changed, but still had a little bit of miles left before it was due. The weather forecast was calling for rain off and on throughout the day with lots of clouds. There was no guarantee that I was going to be able to do any pictures, but since I needed to burn about 100 miles, I figured that I might as well take my camera and go driving. Who knows where I will end up, but if nothing else, I would be able to find some more potential subjects to put in front of my camera. I loaded up the truck after sleeping in for a little bit while a monsoon was going on outside. After looking at the weather maps, it looked like my best chance to dodge the rain was to travel North, so that is just what I did. 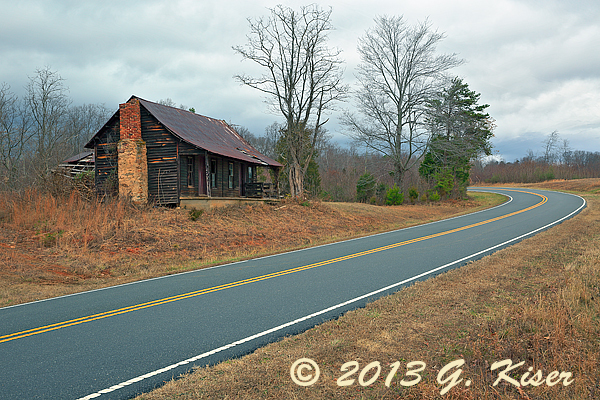 I set my sights on Hanging Rock, not wanting to go to the park, but to drive in and around Stokes County looking for some old barns and rusted vehicles. The sky was doing some interesting things. At one point, it was almost totally clear, and then the white clouds came in. I wasn't sure from one moment to the next what would happen if I were to find something that caught my eye. Like a kid with Add I turned right and left hunting down things that caught my eyes as I passed by intersections. I found myself driving past South Stokes High School at one point and thought that I would need to redirect soon, but I found myself at another intersection. The ADD kicked in again and I decided to turn right on Hawkins Rd because I saw an old barn. That one didn't really hold my attention so I kept on driving. Then I saw it....A house...no....two houses.....and some barns too! They all fit my criteria for my Wabi Sabi photography. They were in various states of disrepair, and obviously had been left to succumb to the weather. I pulled off of the road and got out for a quick walk up a hill to see what my options were for a composition. The house was surrounded by trees which would make for a difficult organization, but I thought that there was enough potential there for me to go and get my camera. I quickly returned and started working out a composition that I liked. I started close in, but didn't really care for how things appeared with the house filling the entire frame. I decided to step back a little bit and give the house some room to breathe. I was working with my favorite lens, the 24-70mm f/2.8L which gives me a lot of flexibility when it comes to perspective. 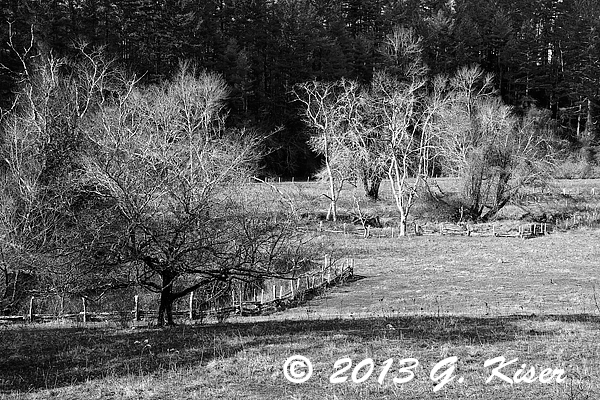 I found a loose line of trees that I could incorporate leading the eye up to the house, and hopefully taking the focus off of a white sided barn to the rear of the house that I had no choice but to include in the frame. I was taking some test shots to see how the lighting was working out, and much to my disappointment the sky was much too bright, and the house was in too much shadow. I was having a very hard time working out an exposure that would balance the scene. There was no way to use a filter to fix this because of the height of the house against the sky. I was moving the tripod back a little bit to adjust the trees so that the windows and doors were not blocked by the trees. As I was moving back, the sun appeared from behind me. It cast a wonderful warm glow on the property. I had to move quick to take advantage of this. I plopped the tripod down, leveled it quickly, checked that the camera was level, set the focus for what I was counting on being a good hyperfocal distance, set the exposure, and fired off one shot. This process took about 15 seconds or so, but felt like a lifetime! By the time the image popped up for review on the LCD, the sun was gone and we were back in the shadows. In the 30 minutes that I was working this house, I had that sun for about 30 seconds...just long enough for this image. I'm just happy that I was able to react so quickly and get this grab shot because all of the other images paled in comparison to this one. After coming to terms with the fact that my light wasn't going to work with me any more, I started moving around the property to see what else could be photographed. 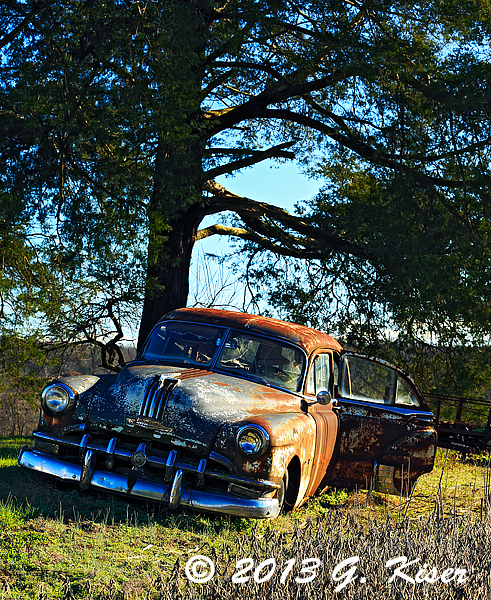 There was an old Dodge pickup bed behind the house, but it wasn't photo worthy in my opinion. I did see the old chimney on the back of the house which caught my eye. There was a tree growing right next to it, and some other signs of neglect. The stonework was still very nice though, and I thought that since the lighting was good here, I would give it a try. One of the problems when picking an intimate scene like this is having it make sense after pulling it away from its context. I played around with the composition for a good while trying to include only what I wanted, and nothing else. I only made two exposures of this scene before moving on. I wasn't sure if I liked it or not, and originally it was cut on the editing room floor. However, for some trivial reasons, I decided to "develop the negative" and see what I had. It was better than I first thought, but I still wasn't sold on it. Knowing that Toni has an incredible eye for a good picture, I showed it to her. Even though I was on the fence about it, she really liked it. So...that being said, I finished processing and printed it out before uploading. Having worked the house all I could, I turned my attention to the other house that was across the road. It was pretty neat, but when I looked at it from this angle, I saw that the roadway was going to be an important element in this picture. The long sweeping curve was just perfect and provided the exact element to the composition that I needed to really make this shot pop. I found my section along the shoulder of the road that I figured would be the best vantage point to create the composition. As I was dialing things in, I felt the rain start to fall. It wasn't too bad, so I continued with setting things up. For once, the sky was actually very close to what I was wanting. There was enough texture in it to provide lots of interest, and most importantly...it was not that bright. I was able to get a very balanced exposure, capturing detail in both the shadows and highlights. I didn't have any time to celebrate or to confirm that I had the best possible picture because the rain was starting to get heavier now. I rushed back to the truck where I packed the camera back up and loaded everything back in the cab. I got in just as the bottom dropped and a torrential downpour found its way to my location. I continued on in scouting mode since the weather was too miserable to get out and shoot at this point. I continued down Hawkins Rd and found an old GMC pickup along the side of the road...off to the side of the property was an old MG, and another old truck, an old car....oh wait, off in the distance were more! There was nothing that I could do with these pieces today, but I sure intend on returning when the weather is favorable for the subject matter. The nice thing is that there are a couple of different weather patterns that will work for these old relics. I continued in scouting mode for a while later, and even came back by my old cars.....just in case. But as I approached them, the rain picked back up again. It just wasn't in the cards for today. I decided it was time to go and get gas and start to head home. After filling up, the rain seemed to be tapering off, and the closer to home I go the lighter it became. I figured that I had one more leg of scouting in me before servicing my truck. I struck out on Hwy 158 toward Stokesdale because I remember there being an old tractor on the side of a field that I had photographed about four years ago. I remembered exactly where it was and pulled off the road at the edge of the field. I couldn't see the tractor, but decided to get out and check, just in case it was still there. BINGO!!!!! Not all of my luck was bad after all. I found my tractor just as it had been all those years ago. Because of the close quarters, I swapped my normal lens for my telephoto 70-200mm f/2.8L so I could really isolate the tractor from the overgrown section of the field. There was a little bit of drizzle so I left the lens hood on to protect the front element. I worked several variations of this composition. 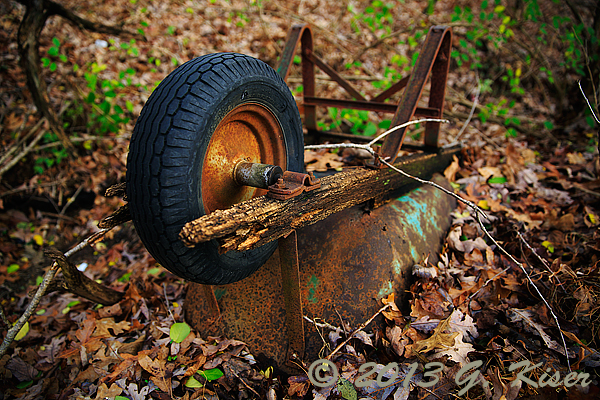 I really wanted to include the rear wheel, but because of the tall weeds by the seat, the wheel looked like an afterthought to the image, and there was an unrelated wheel propped up against the tractor wheel. I had a lot of fun with this tractor. 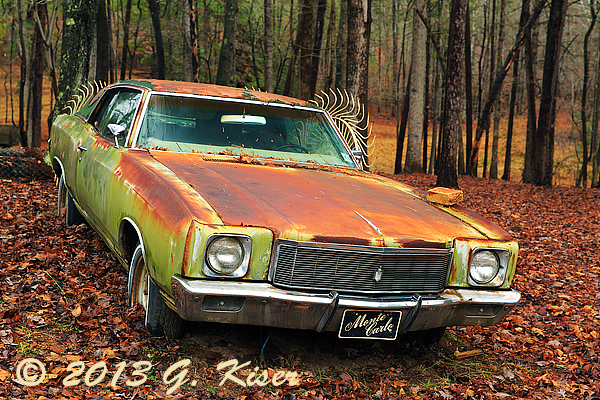 The rust just jumps out at you, and you can almost touch it. I have always thought of the front of this tractor as a face. For some reason, today, the bumper stuck out at me. That made naming this piece an easy task. 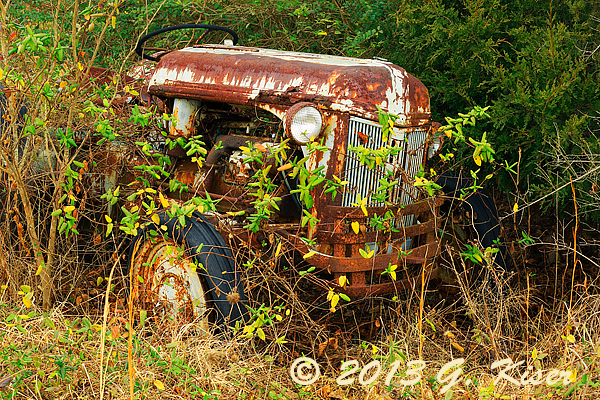 Even though the tractor looks very rough, there is a certain contented smile in that rusted face. Having done a similar composition of this tractor in the summer, I wanted to do something a little different. Off in the distance there was an old farm house which was also partially overgrown with weeds. I wanted to link both of these elements in one cohesive shot. I tried to use my telephoto to compress the scene and equalize the sizes of the two elements. The problem that I ran into was I was staying in the 70-80mm range and having to go with a portrait orientation to make it work. The image was ok, but not what I had in mind. It looked too much like a snapshot. I decided to swap out lenses again, and put on my 24-70mm f/2.8L which would allow me to go a little wider, while still keeping a compressed perspective, and most importantly, allow me to shoot the scene in landscape mode. A problem that I developed after getting things set up was the sky in the upper left. There was no way to eliminate it, and I had minimized it as much as I could. There was no way to get an exposure to work that would cover the range of tones that were included in this image. My only option was to fit a 2-Stop hard ND Grad filter to address that one section at the top. That did the trick, and my histogram fell into line with a good exposure. I snapped this one as the rain drops were falling more and more quickly. Using the 4x6 filter made it impossible to use the lens hood. I was getting drops on my filter, so this one shot was all I could manage before my equipment became covered in rain drops. I moved over to my camera bag to put things away as the drizzle had turned into a heavy downpour. I went as quick as I could, but everything got soaked! Thank goodness for Canon's weather sealing on their top end cameras and lenses. At least I would not have to worry about water damage. I put the drenched bag back in the truck and headed home for the day very happy about what I had managed to capture. I had high hopes for today, but things don't always work out for me when I plan things. Based on a suggestion from a friend at work, I was planning a Trek to Davidson County with a handful of address to check out. The intention was to get some barns added to my collection. I knew that a nice cloudy day would be a great start for barn photography and I had seen that based on the forecast, today was going to be just such a day. I got a later start than I had planned due to staying up very late processing the images from yesterday's hike at Stone Mountain which was very successful to say the least. I did finally get up and saw that the forecast was still calling for cloudy conditions, although it looked rather bright outside. There was a good overcast, but very little visual interest in the sky. I decided to go ahead and give it a shot and see what was out there. If nothing else, I would be able to scout the area and see just what types of subjects were to be had out there. I followed the GPS coordinates down to Old US Hwy 64 E and found that there were quite a few barns and old houses out this way. The problem was, the sky was too bright white to include, and the clouds were not thick enough to really diffuse the light sufficiently to shoot into the shadows. I pressed on, hoping for the best. As I was almost at me destination I came upon an old house with a barn off to the side. It caught my eye, but the sky was not going to work for this subject at all. After arriving at my destination, and seeing that the barn I was searching out was deep inside of somebody's property, I opted not to pursue that particular barn. I had one that I liked a bit more just a few miles down the road. By the time I got there, the sky had changed, and it was now blue, with some hazy clouds passing by. It wasn't ideal, but it was close enough to give it a chance. I pulled my equipment out and kept the 24-70mm f/2.8L lens on the body since I was going to be shooting from the road. I almost could have gone to my telephoto, but that would have been a little too much of a long lens for the job at hand. The sky immediately started giving me problems. I had a polarizer on initially and could get a fair amount of blue in the sky, but it was at the expense of the detail in the barn. I saw no change in the sky coming any time soon so I dropped back and punted. I pulled out a 2-Stop hard ND Grad filter which I slid in to control the exposure in the sky. That did the trick and got a nice even exposure all around. Now it was time to really work out a composition. My vantage points were limited because I was forced to shoot from the road. To make matters worse, there was a tall bank of undergrowth along the shoulder of the road. I had to crank the tripod up as high as it would go so that I could overshoot the brush and not get any of it along the bottom edge of the shot. I settled on an area that showed a nice 3/4 view of the barn. The side was in the shadows, but I figured that some clouds would pass by and diffuse the harsh light eventually. At this point, it was just a matter of hurry up and wait. I waited....I waited....and I waited some more. The sky was ever changing, but never in the direction I wanted. I started to get frustrated, but held fast to my shooting position. In about 30 minutes time, I cranked off about 11 frames with different lighting, and sky. When it was all said and done, I honestly wasn't sure what I had, or if it was going to even be a successful image. I kept going deeper into Davidson County, and followed directions to two other potential locations. I kept seeing interesting subjects, but nothing that I could work in the existing light. 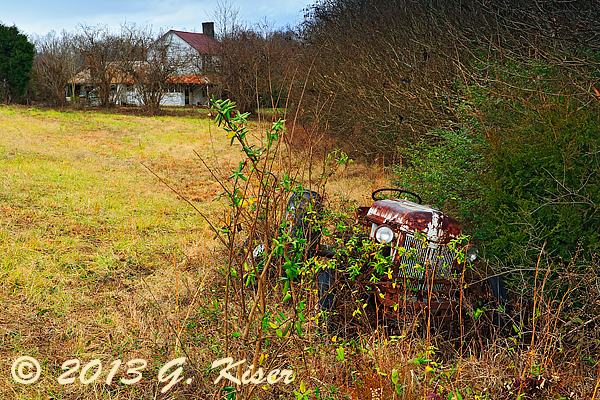 I did happen upon an old tractor next to a red and green barn which caught my eye. I looped back around and drove up to the house. I knocked and rang in an attempt to get the owner to come to the door, but after nearly a minute on the porch, I decided to give up and started back to my truck...as the door opened. I advised what my request was and she told me that the tractor was her husband's and he wasn't home. She did not want to give permission for the photograph without him. She invited me back later on when he would be home, but I was seeing that the light was already changing and the scene wasn't as impressive as it had been just 5 minutes ago. That moment was gone...time to move on. I drove around for nearly 120 miles and the only thing I found was a new found frustration with the sky. One minute it was very dark and I could have photographed any number of things. Of course, when that was the case, there was nothing to photograph. The other end of the spectrum was when I finally made it back to a potential subject...then the sky would open up and the sun would shine through with a vengeance. It was almost as if the heavens above didn't want me photographing anything today. I called it day and headed home. I had 11 frames captured, of one barn. I just hoped that I could use one of them. As it turned out, there was one that I found had a little bit of character to it. It wasn't nearly as successful of a Trek as yesterday's, but I can at least say that I got one new picture to add to the collection. It had been a very long week at work....to say the least. I was finally off, and able to do some more work with the camera. The problem was that the weather was just not right for my first day off. No clouds in the sky to speak of. At least until the late afternoon when the sky was quickly covered with a whitewash of overcast. There was just nothing that could be done with those conditions at all. My second day off, however, brought with it the promise of some clouds. 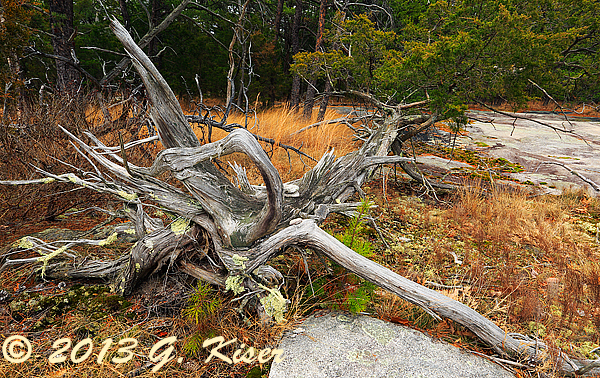 This was good news, because I have been really wanting to return to Stone Mountain State Park in order to photograph what I believe to be some of the more interesting trees in the area. The partly cloudy conditions seemed right for that, so I made the plan to head out to the park with my wife and photo wench, Toni. Before loading up and heading out to Stone Mountain though, I decided to take a quick morning walk down the road to a barn which is about one mile from the house. I wanted to play around with some long exposures and try to come up with some interesting pictures in some very low light. While I have tried to do similar shots in the past, this was the first time I was using all existing light, and was trying to include a subject that was not exactly light colored. I tried exposures from 2 minutes up to 20 minutes with moderate results. While my results weren't all that grand, I was learning with every press of the shutter button. While my low light shots were lacking punch, I quickly realized that the sky was starting to develop some color in the few passing clouds. This was promising!! I swapped some filters around and started to dial in my exposure. With the help of a 3 stop, hard edge, reverse ND Grad filter I was able to control the sky, and still get a reasonable exposure on the barn. The highlight of this picture is the tree framing the color behind it. This the only the second time that I've gotten a sunrise to mimic the shape of the landscape below. I just couldn't have been happier the way that this early morning "test shoot" turned out. Had it not been for the surprise color in the sky, I don't think I would have had anything to show from the hour that I was out in the cold. After walking back home, I got things put together for a short hike at Stone Mountain. The best part of this was that Toni was going to get to go with me. This is the first "Trek" that she has been able to join me on since I got started with photography again. We packed some snacks and got all the equipment that we would be needing and headed out to the park. All the way there, the sky looked rather boring...a wash of white for the most part. Occasionally, there would be some texture, or a peaking sun, but for the most part, I was uninspired. However, we kept on driving down the road knowing that things can change at any moment when it comes to the weather conditions. As it turned out, this was one of those times. As we got closer, there was more texture in the clouds, and a little more density to boot. It was still going to be a gamble as to whether or not we stayed low in the park, or if we climbed to some of the elevated vantage points. After a quick discussion, we started gaining altitude along the Wolf Rock Trail. Toni, always interested in trees saw this section of the trail and pointed it out to me. I have to admit, I would have normally passed this by, but I have learned over the years to trust her eye when it comes to potential subject matter. I unpacked the camera, leaving the 24-70mm f/2.8L lens in place. I worked to find compositions that made sense of the chaos of the trees I was seeing. To make matters worse, the sun was starting to peak through the clouds which made for some difficult exposure settings. 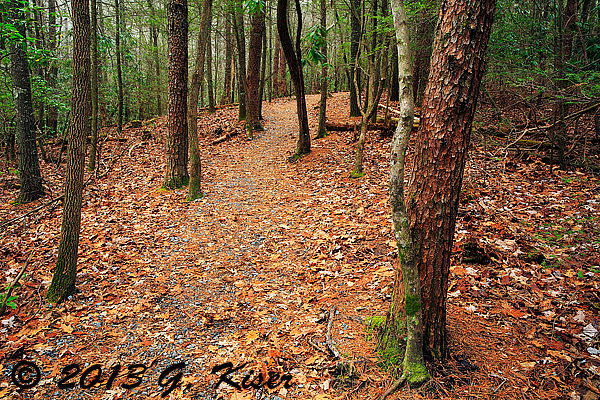 When things got too difficult, I moved further along the trail and shot in the opposite direction. That seemed to do the trick, and I ended up with two images which I feel pretty good about. That was just from the hike up to where I really wanted to be! I was feeling pretty good about the potential in this Trek already. Before long we arrived at Wolf Rock to see that the clouds were moving in, and that they had pretty decent texture to them. We hunted around quickly to find the right area to take advantage of the clouds where they were in the sky. My favorite tree was in the wrong position for a shot just yet, but I had high hopes that the clouds would be moving that way shortly. In the meantime, I found another small tree which was positioned just right for the clouds. Since the tree was so small, I decided that I would make it appear much larger by using a wide angle lens, so I swapped my lens out for a 16-35mm f/2.8L, which would accentuate the tree, and show a lot of the sky and mountain range behind. While the sky was nice and cloudy, I quickly realized that it needed some help in the exposure department. I really wanted a moody sky for this particular shot and the best way for me to achieve that was the use of my ND Grad filters. I played around with several combinations until I found ones that worked for the look I was after. The resulting shot is very moody, and full of saturation in all of the colors. Since the star of the image is the tree with the knotted and beaten down appearance, I decided to title the piece Crippled Limbs which I think calls the attention to the tree which is still very picturesque against the dramatic sky. From here, it was time to go back to my original subject and see if the sky was more forgiving now that some time has passed by. 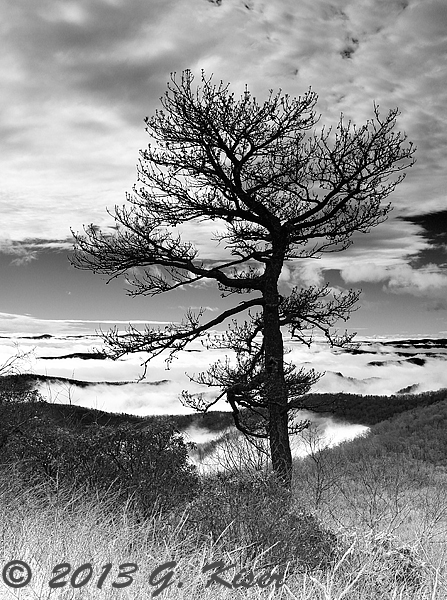 Sure enough, the clouds had moved over to that location and it was ready for the photographic treatment. Again, I had to make use of the ND Grad filters in order to keep the sky under control. They worked like a charm, and gave me the overall exposure that I was after. This has to be one of my favorite trees in the whole park. I wish that it was a little more isolated, but it is easy enough to compose the image without allowing the neighboring tree to take up any valuable real estate in the image. It took a few exposures to get things sorted out, but I was able to get one that I really liked out of three attempts. 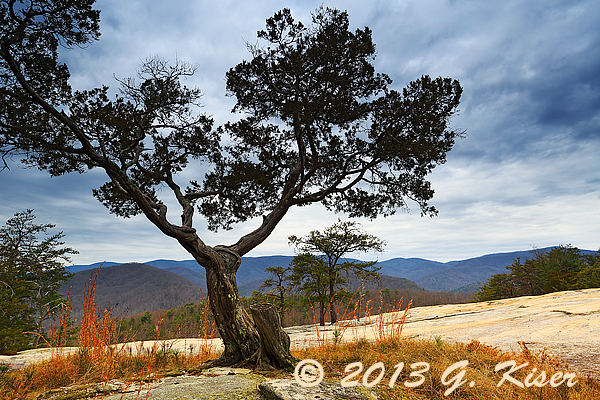 I was having a lot of fun working these trees along the ridge of Wolf Rock. So much fun that I had Toni help me find another tree to photograph. The one that she found wasn't exactly like the others that I had been working on....but it was very cool in its own right, and I knew she had picked a winner! Here was this amazing tree which had fallen some time ago. The root system was a mangled mess, and very much exposed since it had been growing on the rock face for the most part. There was no clods of mud and dirt to block the lines and angles. The stark, bleached look of the wood helped it to stand apart from the rest of the landscape as well. Everything just worked about this tree, and in just a few exposures, I had this image worked out. While I was working on the fallen tree, Toni had found another scene with a tree and a pair of rocks positioned kind of close to each other. It had captured her eye, but the way she was seeing it wasn't going to transform all that well into a photograph. However, I did see some potential there, and started to work it out by including another element...the dished out places on the rock surface that holds little pools of water. Again, I needed the help of my ND Grad filter selection to keep the sky under control while I exposed for the foreground. I was able to include the single tree along with the rocks to the left. Using these two recessed elements in the foreground, I was able to create an image that made visual sense. An interesting element to this image is the sense of scale, and place. There are just a handful of visual clues that help to establish scale. The leaves in the puddles are the best clues, but they are exaggerated due to the wide angle lens that was still mounted to my camera. The foreground has some strange curvatures which make you feel a little off balance...just as we were standing on the rocky surface. Finally, your eyes will hit the horizon and the image will start to feel tilted. It isn't, there were two spirit levels which were utilized to ensure that everything was plum at the time of the capture. This is just the way the NC mountains are at times. All in all, it does make for a visually interesting piece. After working all of the readily apparent subjects atop Wolf Rock, Toni and I went back to the trail and continued on in search of Cedar Rock. 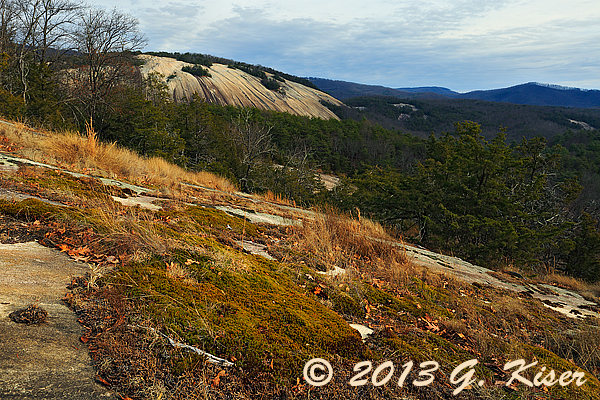 This was the next overlook area and I recalled it having a pretty good view of Stone Mountain itself. While we were running out of time, and the sky was starting to clear, we felt that we owed it to ourselves to drop by for a visit and see what we could see. 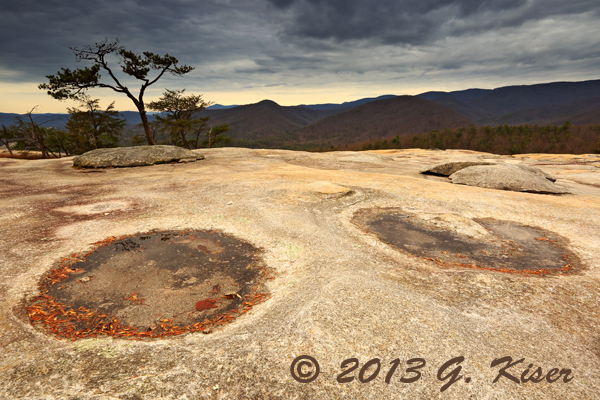 I had a very hard time finding a suitable foreground element, but I really wanted to capture the distant exposed rock. The sky was still interesting, but I knew that my time was short. I finally came to a place that was quite difficult to stand on because of the extreme slope of the landscape. I decided to make that my foreground interest. Beyond is the highlight of the image, the namesake of the park. I would like to have worked this out a little longer, and tried some more compositions, but in a very short amount of time, the clouds had passed over the ridge and left a very blah, and plain sky in its wake. It was time to pack it up and hike back to the truck. I felt pretty good about the day as I had a good many pictures saved and waiting on my review. It was a great day in the mountains. Not only did I get to spend some quality time with Toni, I got to add a whole new category of picture to my resume. While winter is not my favorite time of year to capture landscapes, there are some scenes which can actually benefit from it. 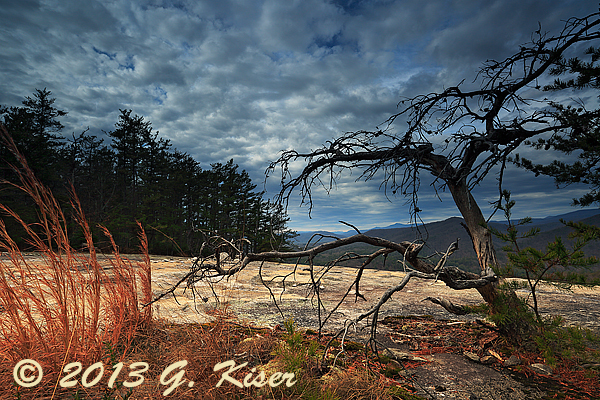 I think that many of the scenes at Stone Mountain lend themselves to the barren look of the season. Spending Time With the Cows...and a Donkey! I'm sure that you are looking at the title and wondering just what in the world I am talking about and how this applies to photography. If you aren't, read the title again. No, I haven't gotten into farm animal photography, at least not yet anyway. This Trek started out a little strange, and ended even stranger. After a solid week of nothing but rain in the forecast every day, I was starting to wonder if I was going to be able to get out and take any more pictures before my vacation was over. Tuesday started out like so many others with rain all morning long. In fact, there was some heavy typhoon type rain early in the morning. Because of that, I kind of set back and decided that it was going to be another indoor day. The rain stopped, and the cloud cover was nice and thick. Thinking about all the rain that we had been having recently, I thought that waterfalls would be a good choice for me. The one waterfall that I wanted to go to was just too far away. I would have to visit Roaring Fork Falls in Little Switzerland another time. Today, I needed something close by so I wouldn't lose the cloud cover. Hanging Rock was my go to park for waterfalls today since it was close, and there were still several falls I hadn't been to in many years. I got changed and loaded the truck up. I headed North along Hwy 8 with thoughts of Hidden Falls and possibly Tory's Falls in my head. As I was driving, I couldn't help but think that I had worked both of those waterfalls nearly to death over the years. There just wasn't that much more that held interest for me there. Yeah, I could photograph them, and it was a great day to do just that, but I was already feeling empty at the thought. I wanted something new, something exciting. I decided to veer off onto some side roads and see if there was anything that caught my eye while I was still headed to Hanging Rock. I saw a lot of old barns but nothing that really caught my eye...until I passed one off to the left. It looked very nice from the road, so I decided to turn around and check it out. When I got back and looked at it a little closer I found that there was just no way to photograph it without including lots of housing in the background...just not cool for a barn picture in my mind. Slightly discouraged, I turned back around and began to make the march to Hanging Rock again. When I got to the intersection, I decided to go straight and see what I could see down that way. 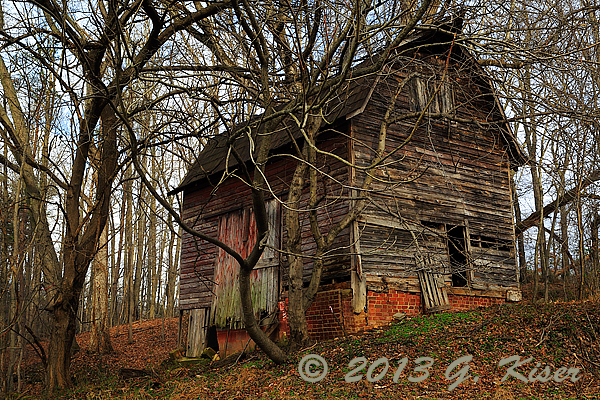 Again, I saw several old barns, but nothing that really grabbed me. I made a few more turns, all keeping me directed towards my destination. Shortly after passing through another intersection, I happened to observe some sort of green car (circa 1970-something) in a field well off of the road. As I passed by, I caught a glimpse of a light colored 50's model pickup. Yeah, I was going to have to pull over and ask permission for this yard. I determined which house belonged to the potential subjects and parked my truck. I made the long walk down the sidewalk up to the front door. Nothing like feeling like the guy that causes the residents to call 911. Well, that was me, scruffy face from not shaving, and wearing all green clothing. I rang the bell and a lady came to the door. I introduced myself and explained that I was interested in the old cars and the truck in the driveway. She seemed very nice and said that they belonged to her husband and he was currently on the phone. Of course, I could just imagine that he was talking to a dispatcher who was about to send a deputy out to talk to me. After a few minutes, he came to the door and I again introduced myself and explained my purpose. He then asked a question I had not had to answer before...."what are you going to do with the pictures?" Well, I told him that they were for my use, and that I just really enjoyed photographing old vehicles. I could tell that he was not buying my story at all. I was loosing him and I was figuring that I was going to have to pass up on the opportunity for these cars and truck. He was still talking, so I thought I would illustrate what I did a little better by pulling out my smartphone and accessing my gallery of pictures. I started to show him one after another of my recent collection. When we got to Ole Blue which featured a Chevrolet C10, I had him hooked. He started to ask me questions about this truck. He liked the picture, and was interested in the subject matter to boot. I wouldn't tell him where it was though as I could tell he was a private man. He asked if I was going to share the location of where his vehicles were and I assured him that I would not. He started to warm up to me then and told me that he had a photography student come by and ask to take some pictures a while back. He had let her, and he was going to let me. He met me in the driveway as I was getting my gear on. He explained that the Monte Carlos were out in a field that was very muddy. I told him that was fine since I was prepared to stand in water for some waterfall photography today. He escorted me down the driveway and showed me the truck I had seen from the road. He said that there wasn't much that could be done with it as a photograph since there was too much clutter around it. I quietly disagreed with him and we kept on to the fence. he opened it up and pointed out the best way to get to the cars so as to avoid the majority of the mud. Before he parted ways with me, he asked if I was going to be going into any of the cars. I reassured him that I would leave everything as I found it, and had no intention on moving anything, or tampering with anything on his property. I in turn asked about any animals. He replied almost laughingly that there were cows, but they would probably not bother me, and then there was the donkey...he would keep his distance. Almost as an afterthought, he asked how long I would be. I said probably an hour or so. Surprised, he replied "that long to photograph junk?" Yep! He wasn't kidding about the mud! It was slippery with the mud, leaves, and assorted cow pies I was dodging. Oh well, I had gone through this much trouble, I was going to get some pictures even if I got dirty boots. I arrived in a few minutes at the cars. There were a half dozen old Monte Carlos as well as some other truck parts, and farm implements. It was going to be difficult to get simple compositions in this field but I was committed to trying. I started work on the complete car which was fortunately off to the side. There was a truck bed on top of another frame of some sort parked very close to this car. There was also some sort of farm equipment placed behind the car. While it didn't really go with the car, it somehow worked with the image giving it a real sense of place and situation. This car was no longer used, and had been out of service for some time now. However, the vanity plate on the front of the car showed that it was loved at one time by the owner. There is a story here...I just don't know it right now. While working this car, I would occasionally turn and see what was going on around me. I could see the donkey about 50 yards away from me. It didn't seem like he had any interest in getting closer but was curious about my presence. Every so often he would make some noises which I assumed was designed to keep me in line. I adjusted to the sensation of being watched, as I was sure the property owner was keeping an eye out on me as well. The car that had caught my eye from the road was sitting off on its on. This was fortunate as it gave me a little more flexibility in my composition choices. I found myself having to wrestle with the sky which was a pretty uniform light gray. There was no visual interest in it, and therefore, I would not include it in my shot. The car was positioned on a hill with the front aimed uphill. The fact that there was no engine, or body beyond the firewall amplified the nose up attitude of this car. I decided that the best way to work this out would be to introduce some perspective distortion to the image and embrace the angle the car was sitting at. I was already using my favorite 24-70mm f/2.8L II lens which was able to zoom in to isolate the previous subject. I just utilized the other end of the spectrum for this car and racked it out to about 28mm and got down kind of low to the ground. I found that by shooting from the front right quarter, I was able to include a good portion of a nice and green tree further on down the field. With a nice depth of field, I was able to keep sharpness throughout the image. I realized that I had been very involved with this particular shot and hadn't looked at my surroundings in a while. I decided I needed to make a visual sweep real quick and see where my friend the donkey was. I turned around and found myself face to face with about 7 or 8 cows. The smallest was slowly working her way toward me. The real interesting thing was I had just about become cut off from my camera bag which was sitting on a bush hog to my rear. In order to protect my camera, I picked it up and carried it over to the bag...very slowly. I closed up the bag and put it back on my back. I then slowly walked back to my original spot to continue working the remnants of the old Chevy. Before I was able to get back in my groove, I turned again and saw the cows over where my bag had been and they were sniffing around where it had been laying. The donkey was also back and was much closer than before. He had a look on his face like, "its time for you to leave, I brought my friends to help persuade you." I can take a hint, I was trespassing on their property, and even though I had permission, they weren't consulted. So as not to make any of them upset I decided that it was time to go. I made my way slowly back to the gate with the cows and a donkey right behind me. I guess they wanted to make sure I knew where the door was and that it didn't hit me on the way out. Once I made it to the other side of the door, one of the cows let loose a loud mooooooooo. I can only speculate that it translated to "and don't you come back either!" Well, I had worked the cars pretty well, and it was time to see what I could do with the truck in the driveway. It interested me because there were two different barns in close proximity to it, that I was pretty sure I could include in a composition. I did know that I would have more time to figure it out since I left the farm animals on the other side of the fence. Here you see a rough idea of what I had to work with. I had a very hard time determining the proper framing needed to include not only the truck, but both barns, without including the sky. I needed to get some elevation in order to keep the sky out of the frame, and I needed just that perfect focal length in order to include the elements that I wanted. It was not going to be easy. I found that my best choice for a composition came from a vantage point on the corner of the garage. The driveway made for a nice elevated platform where I could capture exactly what I wanted to include. 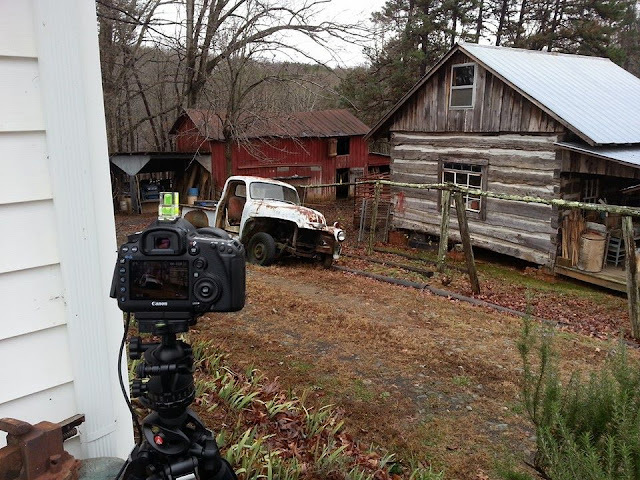 The exposure was simple, aim for maximum depth of field, while keeping the light colors of the truck from blowing out, and trying to underexpose the open garage to the rear so as to deemphasize the tractor sitting inside. Simple huh? Well, I guess it was because one frame was all it took and I thought I had nailed it. With the setting, there is no question about the use of this truck. It has long since been put to rest, but its parts are obviously being used to keep another truck running. Chevy's ad slogan was "The Heartbeat of America". Well, I could tell the heart was still beating in this old truck, and it was still living on in other trucks. Who knows, this truck might someday be put back together and ride again. With that single exposure captured, I made a quick walk around to make sure I hadn't missed anything I thanked the property owner for allowing me this great opportunity and I loaded the truck back up and headed back to Hanging Rock. Unfortunately, the sun started to come out, and my clouds all just evaporated from the sky. You know what....I was ok with that. I had made a side trip that cost me the chance to work some waterfalls, but what I found was much better without a doubt. I went home a very happy photographer! This day started as so many did on my vacation...rainy. I tell you what, we are getting positively waterlogged this week. While the clouds are great for photography, its just no fun going out in the rain working a camera, so I typically stay home on these days. This would have been one of those days except for the fact that I needed to go to the store and pick up a few things. Just in case, I packed my camera in the truck so that if something presented itself I could take advantage of it. It was drizzling pretty hard when I went to the store, so I didn't really give photography much thought. However, when I was leaving, the rain had stopped and the clouds were still overhead. I thought I would go ahead and take the long way home in hopes of finding something good. Keep in mind, I have lived out here for many years, and have ridden a bike all over the area. However, there are still many roads I have not traveled on before. I happened to take one of them on a whim on the way home. It was right next to Hwy 66 which I have traveled countless times over the years. I found a few old barns, but nothing really worthwhile....that is until I happened to see one waaaaaay back in the woods behind a small house. I found a place to turn around and went back by slowly looking at the old structure. It was oddly shaped, and mired in all sorts of trees, but something about it called out to me. I decided to turn around once again and knock on the door of the house to ask permission to go into the yard. I knocked, but there was no answer. The house looked to be occupied, but I was obviously not going to get anyone to the door today. I slowly walked back to the truck with my tail between my legs. I really wanted to get a closer look at this barn since I was essentially being told "no" at this point. Before calling it quits though, I saw a gentleman working on a light fixture at a small church next door. I decided to go over and ask him if he knew anything about the property. To my surprise, not only did he know about the property, he knew where the owner was. I got so very excited! The owner was in Florida. I got so very depressed. Then he told me that he had his name and number. I got so very excited!!! he didn't have it with him. I got very depressed. But he would be home soon and would call me with the information. Yaaaaay, happy again!!!!! All this up and down really tires a guy out! I decided to continue home. I had my subject in mind and wanted to capture that barn. Until I could do that, I just didn't feel like hunting anything else. I got home and started watching some television waiting for the call that apparently would never come. I kept looking out of the window and was watching the cloud cover start to break up. Well, there went the conditions that I thought would work for that barn. The other end of that, was the sky was now a very interesting focal point. That took my attention off of the barn and I started going through my mental catalog of subjects that could be photographed with an interesting sky prominently displayed. It didn't take me long before I thought of an old dairy barn which I have photographed several times in the past, and have standing permission to be on the property from the security company that represents the owners of the barn. It was about 30 minutes away so I needed to hurry in order not to lose the sky. I booked down the highway with a destination in mind! When I arrived, the sky wasn't quite as interesting as it had been, but was still very promising. 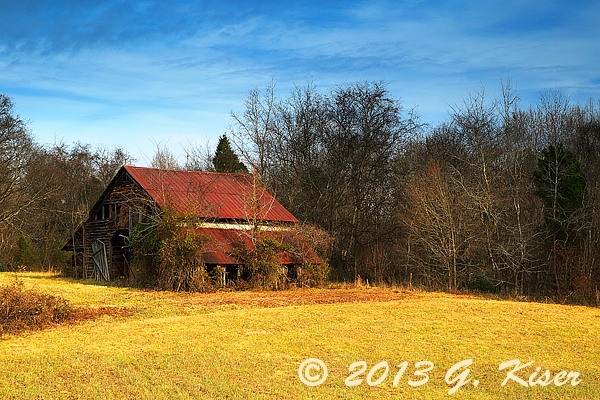 I quickly got the camera and tripod out of the truck and headed across the field to the old barn. I knew where the best composition was to take advantage of where the sun was. I put the sun to my back and set up low to the ground. I used my 24-70mm f/2.8L II in order to decrease the perspective distortion of a wide angle shot. I wasn't going to need an extreme wide angle, but did want something in the 24-30mm range. Since I was shooting down low, I knew that would introduce some convergence in the vertical lines, and I wanted that minimized. Since the sky was an instrumental part to this composition, I decided early that I was going to use a 3-stop ND grad filter to hold back the exposure of the sky, while keeping the barn as bright as possible. I shot frame after frame as the sky changed character many times. I started to get a little nervous when the clouds started to break up though. I really wanted the drama in the sky which had brought me out here in the first place. Then it happened...I was hoping on this, but wasn't counting on it at all....the sun started to peek through the clouds to my rear. For less than 30 seconds the sun bathed the white barn in its bright light. I looked at the meter in my camera and saw that the overall image was overexposed. A quick check of the histogram confirmed that the barn was about to blow out. I quickly dialed back the shutter speed and brought the exposure down to a reasonable level. I knew that this change would darken the clouds which were a middle gray on their own, but I had a 3-Stop filter pulling them back as well. 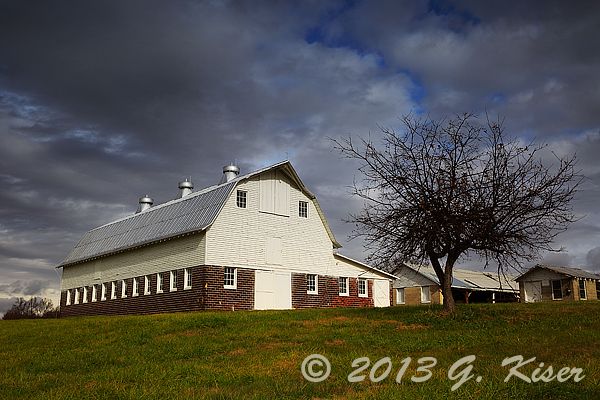 Now, being able to expose for the barn, the clouds were left significantly underexposed....PERFECT!!!! When the review popped up on the LCD I knew I had nailed the look I was after with this picture. By the time it cleared and I was ready to bracket the exposure, the sun was covered again. The moment was past. The clouds continued to thin, and after a short while, the barn was underneath a bland white sky with some pale blue patches. The moment was over....but I had captured the magic when it happened. My fortune didn't end there, however. Remember the gentleman working on the church? Well, he called while I was looking for other interesting things around the barn I could work. He gave me the contact information for the owner of the barn I had spotted earlier. I quickly called and talked with him. I explained what I wanted to do, and he informed me that he had thought that the barn was on his property, but a recent survey showed otherwise. Well, drat!!! He followed that up with explaining that his yard did go all the way to the barn, and that he had no problems at all with me going out there and photographing it. That was all I needed to hear. I quickly threw my camera into the bag and rushed back to the truck. I hightailed it back to Kernersville and located the barn once again. I went into the back yard to see what kind of compositions I could work with. The sky was rather blah, and white by this time. I was not going to be able to use the sky at all in my photographs. That limited me in how I could shoot this barn. I walked all around the yard in search of that one spot which would allow me to tell the tale of this oddly shaped barn stuck in the middle of sprawled out trees. The composition just wasn't coming to me. everything that I did either had too much sky in it, or the barn was lost in the mire of woods that surrounded it. I was getting rather aggravated trying to work out a solution. After all that I had gone through to get the permission to photograph this barn, I wasn't going to give up on it! I thought I would take a break for a moment and think about something else for a little while. I had noticed a wheelbarrow over to the side of the property which I found interesting because of the state of abandonment it showed. I had my 24-70mm f/2.8L II still attached and thought that would be a good lens for this subject. I positioned in close, and focused on the wheel, allowing the rest of the wheelbarrow to fall into soft focus thanks to a larger aperture. I wanted to direct the viewer's focus exactly where I wanted it because there was too much danger of eyes wandering over the similarly toned background. As a creative choice, I decided to leave the stick where it was, laying across the abandoned tool. I really thought that it added to the natural appearance of it. 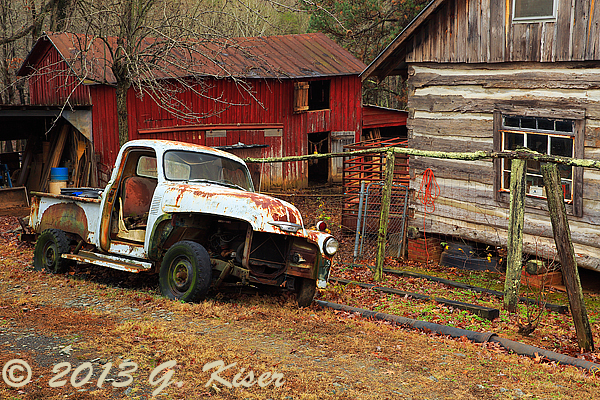 This is a core value of my photography...I like to photograph the rustic scenes as I find them. There is no staging of anything, and out of respect, I don't disturb the settings. The twig, along with another branch to the left almost form a visual arch leading to the wheel, and keeping the viewer's eye firmly on that wheel. Even the container portion of this wheelbarrow is a supporting element to the wheel. 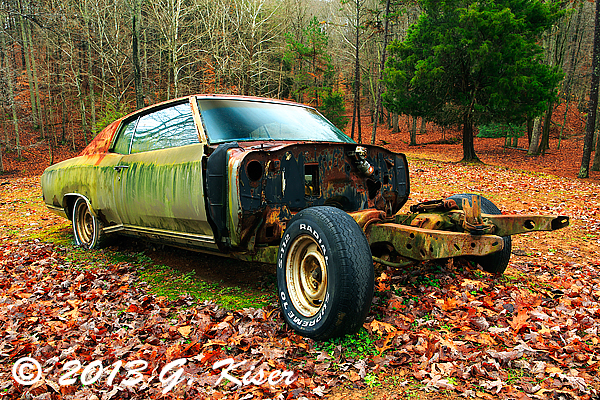 The rotting wood, rusting metal, and dry rotted rubber tell the story all on their own. This was a well used tool at one time, and was left here many years ago, and just....well...forgotten about. Now that my mind was clearing, I decided to give the barn another try. 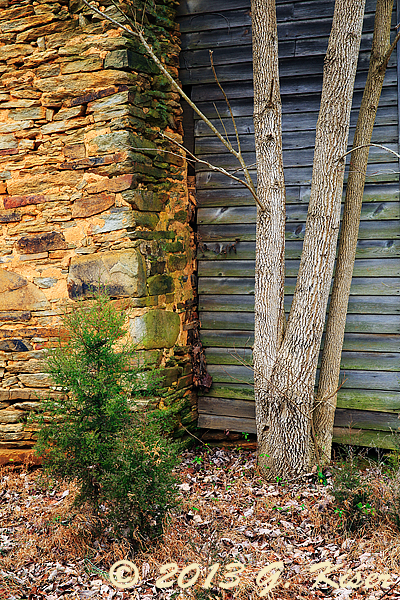 I had exhausted any options of including the barn as an element in a larger composition because it just blended too well with the background that it was intimately involved with. I couldn't shoot it close in from the side with the clearest view because of the bright sky. That left me with one other corner I could work with. This happened to be the corner of the barn that was competently mired in with trees. This was going to be fun....probably not. It took some serious doing to get this shot composed to where it made sense. I was sitting in a pile of branches from a fallen tree in the extreme corner of the yard. The camera was down in the weeds. 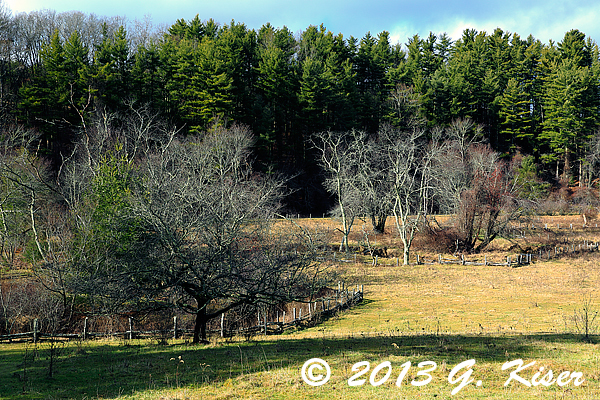 I was using the protruding branches as abstract leading lines from the top leading into the picture. This was a totally odd construct for a picture in my mind, but it was seeming to work. I picked out the best focal point that allowed me to maximize my aperture for maximum depth of field since I had branches very close to me, while the barn itself was about 20 feet away. While I was getting things set up, and wearing out my depth of field preview button, the sky started to clear a bit more. Shadows became a real issue in all of these trees. I also had blue and white patches to deal with in the sky. In order to make the most out of that situation, I fitted my polarizer which would intensify the blue in the sky, while adding some contrast to the wood in the barn. Now, the trick was to wait for just the right amount of light to hit the barn without causing shadows to appear. This process took about 15 minutes. After that time, the sun did just what I wanted it to do, at a time when I had some good blue patches in the sky which kept it from looking like a white sheet was placed over my scene. I saw the result in the LCD and thought that I had something decent. After waiting another 15 minutes and not finding anything better, I threw in the towel and packed up to head home. After culling my images, I found that my favorite image wasn't the dairy barn which I had captured right in line with my vision. it wasn't the wheelbarrow that allowed me to refocus my mind. 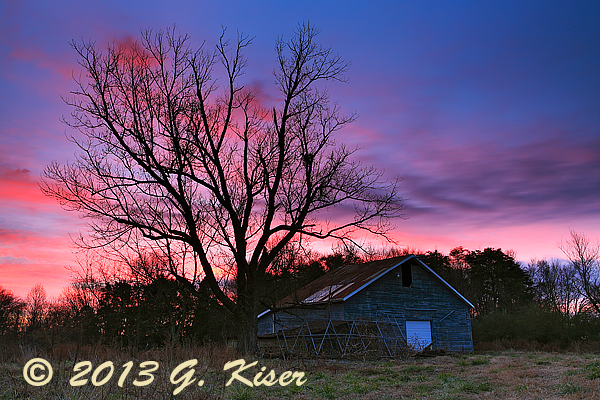 It was actually the barn that had caused me so much trouble while trying to compose the image. Everything just really worked with it, and to top it all off, Toni said she loved the idea of the trees in the image. I was sold, this was my favorite from the day. Maybe it was the completely different composition that I tried, or maybe the subject was just THAT good, and I made a really good call tracking down the owner. 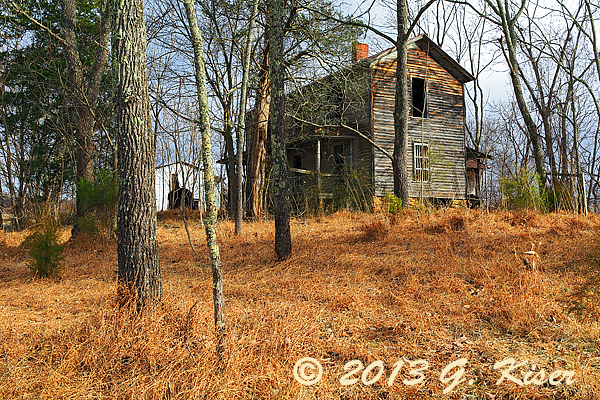 Either way, I'm very happy with the images that I was able to add from today's rustic tour. Well, I've been working my way back into the world of photography for about two weeks at this point. I've experimented with several different landscape styles over the course of several Treks and have felt myself getting more and more comfortable with the camera. The first full work week in December I took off from work for a quick vacation and planned on getting out and doing some more longer term Treks. The problem was....it was raining. Like every day!!!! I was having a problem picking a day to head out and do much. I saw that there was going to be a window of just mostly cloudy conditions with some passing drizzle and I figured that would be my chance to get out. With that kind of forecast and the recent rains, I decided that the best destination would be Stone Mountain so that I could photograph Widows Creek Falls again. I have been here a number of times in the past and have always found this a fun waterfall to shoot. The terrain behind the water resembles something very similar to a skull, and there is a little cave off to the side of the falls which has always intrigued me. The general location is also very nice and picturesque. The only problem there is that most of the terrain is slick rock on a slight incline. Moving around near the waterfall is not the easiest thing to do when you are carrying lots of equipment as one misstep could cause a fall, followed by a slide into a cold pond. This was just not my idea of fun at all. 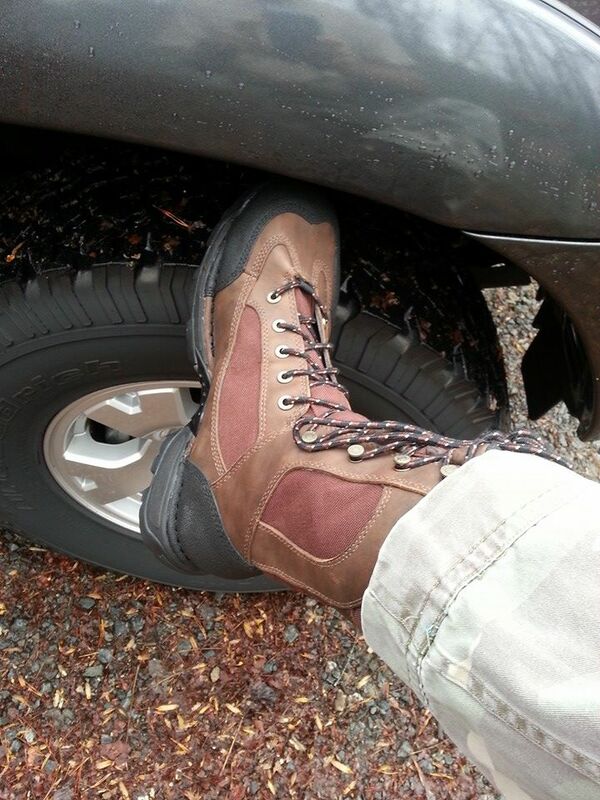 Fortunately, I had some new boots with me today (thanks Toni!) which were taller than my previous boots and afforded me a higher level of Gortex protection for standing in the water. I was hoping not to have to put these to the test, but figured that I would more than likely find myself standing in water at some point in the morning. This is a waterfall after all, and the best compositions are normally found from the water itself. 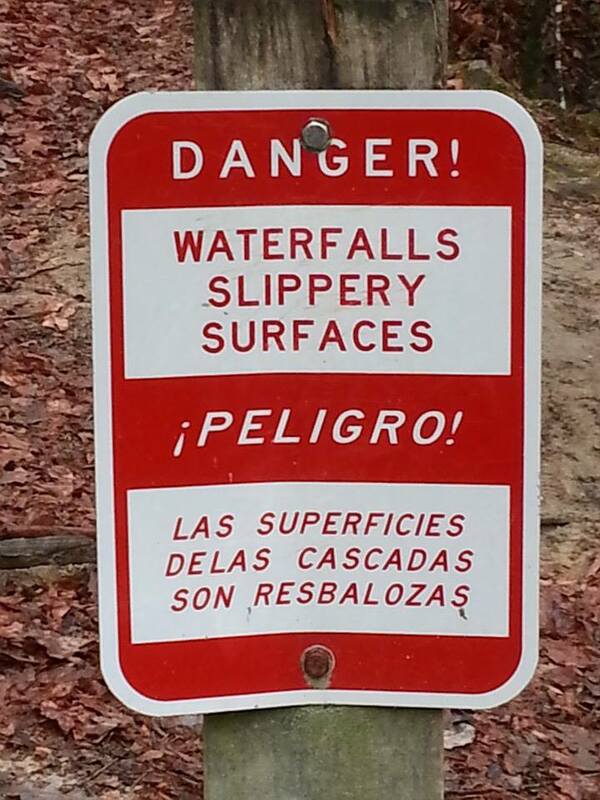 I made the quick hike from the parking area to the waterfall...maybe 75 yards from the truck. I found some very nice water flow which excited me. I also found that all the rock surfaces were still very much wet from the rain, and morning fog. This was good for photography, but bad for grip. I found out very quickly that the new boots were not yet ready for slick surfaces and tended to want to slip a little bit more than I was used to. This should work itself out with breaking them in though. I took the safest path up to the head of the waterfall where I knew the best compositions were. To my disappointment I found several downed trees stretching across the streams from the waterfall. While not terrible, I knew that this would reduce my options for compositions both from my ability to stand there and being able to include that section of water in my images. I started on the left side, standing square in the water trying to get a good composition, but wasn't really happy with what I was seeing. It was OK, but I felt that there was a better composition on the other side. This is usually a fairly easy crossing to make, but the high water level, and slick rocks made it a bit tricky this time. I inched across, taking every possible effort to stay upright. I finally made it to the other side with much relief. I started searching for that composition which I knew to be there. I was working with my 16-35mm f/2.8L lens which gave me a lot of flexibility as to what I could include in the final image. I had the standard polarizer and variable ND filter attached to keep the shutter speed nice and slow. I worked closer and closer to the waterfall itself. I was isolating the interesting parts from everything else. I finally found a nice deep patch of water to stand in (I now know where the tops of these boots are) which allowed me to capture not only the waterfall, but the drop to the lower level pond for some added visual interest. I was able to cut out some clutter to my left that I was unable to avoid in any other composition. 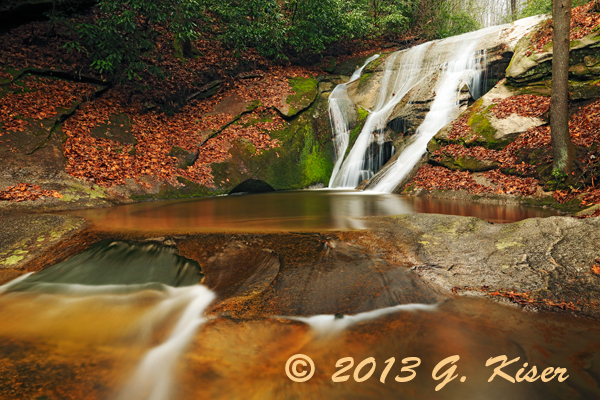 This simplified image really grabbed what I love about this waterfall. Everything was there, and I knew that I had the image right. I played with some exposure settings to make sure that I rendered the water the way I wanted to. It was a delicate balance. On one hand, I wanted to smooth out the runoff in the foreground which was moving rather slow. At the same time, I wanted to keep some measure of detail in the actual waterfall in the background. To fast, and I lost the milky quality in the very prominent foreground, too slow, and I lost the detail in the actual waterfall. Neither was an option I wanted to entertain. After I was satisfied that I had the exposure and the composition that I wanted, I figured it was time to move on. I packed up my gear and slowly worked to the other side and back down to the truck. Since I had some more time to kill, I thought I would go for a walk and see what I could find along Bullhead Creek. There were some more potential areas that I could have photographed, but for some reason none of them grabbed my attention. Instead, I found a trail to the right that I had seen, but never gone down before. I decided to give it a try and see what I could find. 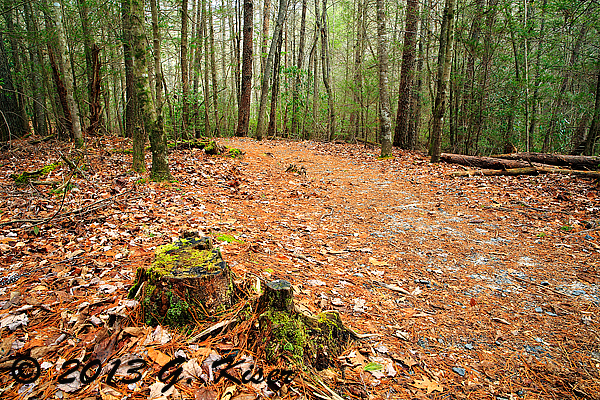 I had no idea where this would lead, but according to my map of the park, I figured out that this was the trail to the backpacker's campgrounds. Oh well, it was worth a walk in the woods to see what I could see. The clouds kept getting thicker and thicker, and I could hear light rain in the trees above me, but I could feel nothing hitting me. While I am not a fan of getting rained on, my equipment is weather sealed and protected from anything short of a serious rain. It was also safely in my Tamrac backpack which added to the weather protection. I plowed on through the soggy trail, passing through foggy sections every 100 yards or so. I was not having much luck finding anything to photograph, but the lighting was nearly perfect, and I was having fun hiking so I continued. Funny thing happened after about 15-20 minutes on the trail. I started to smell what I could only categorize as a camp fire. it was not strong, but was unmistakable as I was walking through the woods. I figured that I was getting close to the camp grounds and that I would probably run into some poor soggy soul making lunch. I thought nothing much of it. Shortly though, the smell became very intense and I reasoned that I had arrived at the camps. I saw a small path just to the left and my nose told me that was where the smell was coming from. I turned, and started up the path, but saw a sign that said "No Camping". Hmmmm, this can't be right. Just beyond the sign, I saw an old rocky foundation with a stone chimney just beyond it. As soon as I saw the chimney, the smell went away....it was gone. Nothing left but the smell of the wet woodland surrounding me. Freaky was the feeling that I was experiencing after that. The chimney was cool, but I didn't see a composition right away. Figuring that the smell had brought me there for a reason, I stuck around for a bit longer to make sure I wasn't missing anything. Then it hit me...there was a patch of moss that lead up to the front of the fireplace. There was my foreground interest. It was on the best possible side for the chimney....this was my picture! I had a very bright sky above to worry about though. I knew that I would not be able to capture the whole chimney, but that was ok. 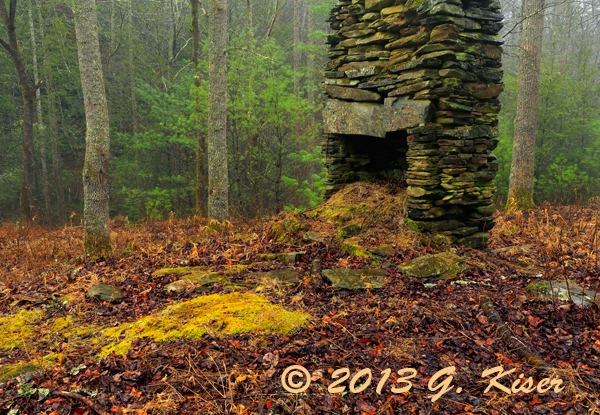 It was the base of the chimney that was able to tell the story...the story was in the fireplace. For this shot, I swapped my lens over to the 24-70mm f/2.8L II which would allow me to compress the scene a little bit more. The hope was to avoid the sky all together. It was actually starting to rain at this point, so I used the lens hood to keep the front element dry. The rain was also causing everything to show a hard glare which necessitated a polarizer to remove that glare. I had everything put together, so it was time to work on the composition. In order to keep the lens dry, and the cut the sky out, I was forced to work in an elevated position. This actually worked out well keeping the moss correctly positioned in relation to the chimney. I cranked off a dozen or so frames with slightly different exposures, and compositions to ensure that I had what I was looking for. With that finished, the rain was getting a bit harder, so I packed up and moved back to the trail. I decided to keep pushing deeper into the woods as I was now on the MST (Mountain to Sea Trail) and thought that I might find something else interesting along the way. Strangely though, I never smelled the fire again. I really think that the chimney was calling out to me in some strange way. I hiked on for another half mile or so and came upon the camp sites. There was no sign of campers anywhere, and no smoldering fires to be found. I did find something else that I did not expect to find, however. 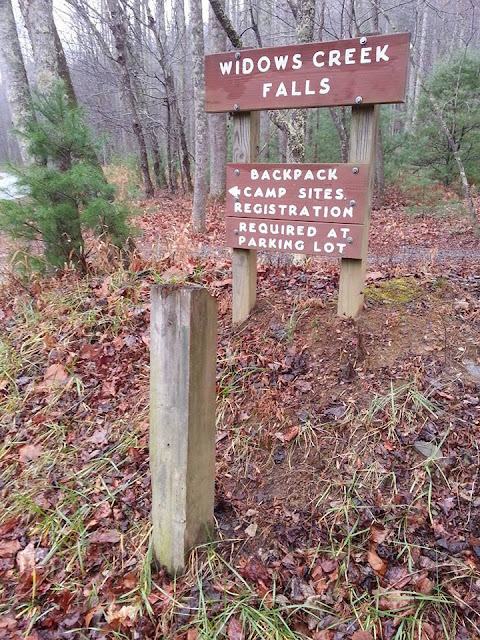 After many years of reading about waterfalls in NC and hunting them out, I was looking at one which had been in my own back yard and I knew nothing about it at all. I don't think that this waterfall has a name, but it is significant enough to be called a waterfall, and was significant enough to justify a few exposures. I quickly added the variable ND filter to the polarizer which was already on the camera. I set things up and started the process for finding a composition. Again, I ended up in some water that was dangerously close to the tops of my boots. My feet were already wet so I wasn't worried about it to much. I tried angles from the left and from the right. I even moved to the center. Nothing was working. As I have found with waterfalls that have two distinct sides with different characteristics its is very hard to find a pleasing composition that will include both of them. There was a small moss covered rock near where I was shooting from which I thought could possibly be used as a bit of foreground interest. To include it meant having much to wide a frame, and I was including some other, less than picturesque elements to the right of the rock. I found the solution by flipping the camera on its side and going for a portrait orientation. 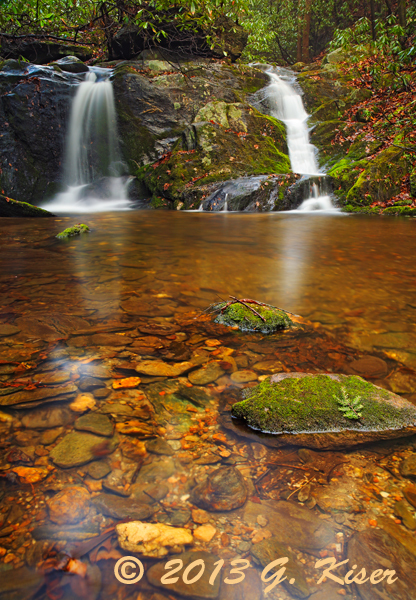 This method seems to suit many waterfalls as it follows the natural vertical perspective of the scenes. This actually ended up working very well. I was able to accentuate the mossy rock, showing detail in the smaller rocks beneath the surface and minimizing the strange relationship between the two waterfalls I was looking at. Exposure again was rather tricky with this shot. Not only was one waterfall in the shaded area, the two were also flowing at different speeds. Two completely different waterfalls, but they were having to share a common exposure. I had to balance the exposure in order to achieve all of my goals as closely as I could. I worked this waterfall for probably a good 30 minutes before I came about this image. I think that overall, it really works. When I was looking at the images from this location, I was rather disappointed in them, and I think it was because I was thinking more about how difficult the scene was to work. After deciding that this one was the best (with the help of my daughter Sierra) of the bunch, I deleted the others. Now, when I look at this image with the day's events long behind me, I see it as a simple, effective composition that does a really good job at capturing what I saw with that waterfall. The day was great, and I enjoyed finding a path less traveled (at least by me). Part of what I really want to do with this new photographic adventure is to try different things, and really grow as a photographer. I don't want to stay in the same rut that I started to find myself in nearly three years ago. Doing things like what I have done here is a great start to that. I no longer know what I will find behind the door, but the thrill of the hunt is back in full force! There are a few pictures that haunt me that I had shot years ago. Not haunting in a bad way though, just pictures that have always stayed with me. One such image is one of a an old bus, from the '50's or 60's I would say, that I stumbled upon accidentally one day after leaving Hanging Rock. I've looked at this picture so many times since capturing it, and thinking about things I could have done different. For the record though, I really liked how the original set turned out, and I wasn't interested replacing those images, but at the same time, I really thought that there was more potential in the subject for some different conditions. I had one problem though....I had no idea where the bus was. Strange huh???? I did find it before, and I took pictures of it right? Yes, that is correct. However, I found it as a result of getting lost one day. I was using a Garmin GPS at the time and I saved the location on the unit, but as luck would have it, the whole thing died one day leaving me with no record of where this bus was. Oh well, no problem since I wasn't in the business of photography any more. Well, in late November of this year that changed, and I once again found myself behind the camera. I was still getting my feet wet at the close of the month, in more ways than one! I wanted another shot at this bus, and I tried real hard to find it on a number of occasions. In a last ditch effort to locate it, I posted to Facebook the question with the original picture attached to the post. Much to my surprise the answer came from a cyclist friend of mine who I had met during the Double Down to the Beach ride several months earlier. June Settle lived several states over, but had family in the King area, and as luck would have it, her stepfather had a certain affection for these old vehicles and might know exactly where it was. In a couple of days she responded with a post confirming that she had located the bus for me, and even gave me the exact coordinates for it. I immediately opened up my mapping app on my phone and started to enter the data. 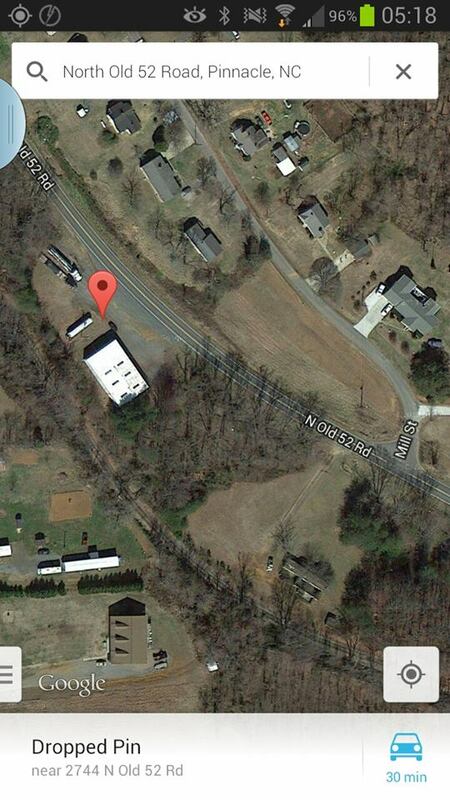 What I found was exactly what I was looking for, just off of Old Hwy 52 in Pinnacle, NC. It just happened to be a little further North than I had been looking. Now that I knew where the bus was, I had to figure out what I wanted to do different with it. I was thinking something different with a long exposure showing some movement in the sky above, using the same basic composition as I had used before. For this, I would need some passing clouds, but not a totally overcast day. The less wind the better since I would be dealing with exposures possibly up to 30 minutes in duration. It just so happened that my first day off of work was looking rather promising in the weather department. Partly cloudy skies and not too terribly cold. That sounded like a winning combination to me so the alarm was set and I was prepared to head out early in the morning to get to the bus about an hour before the sun came up. When the alarm rang, I checked the weather, it was showing fog outside. Hmmmmm, not what I was expecting at all, but fog can be pretty darn interesting to say the least. I kept with my plan and figured if the fog was too thick, I would just wait until daylight and work the bus in the fog. Either way, I thought I would get something interesting with this bus. When I stepped outside of the house, I saw not a bit of fog, and I saw clear skies as well. This was nothing like what I was expecting. This was potentially rather boring as a matter of fact. However, I was up, loaded, and wanting to get some pictures so I pressed on. When I arrived, I could see some light clouds floating in, but no fog at all. This was looking promising again. I went ahead and set up my equipment. I went with the 24-70mm f/2.8L II for a nice wide angle view without any major perspective distortion. There was no need for any filters, and in fact I wanted as much light to enter the lens as possible. With the help of my maglite I was able to set up the composition that I wanted in nearly total darkness which is no small feat. With the composition set up, I worked out the exposure. I set a smallish aperture so that everything was in relative focus and decided that my first exposure would be 25 minutes. I would see where that landed me in the final image. Once you get into bulb exposure times, there is no exposure reading that you can rely on with the camera. For me, its more of a best guess based on the desired effect. I wanted the sky to be very dramatic with some detail in the bus. That was my previsualized goal. About 18 minutes into my exposure something completely unexpected happened...a truck pulled into the parking lot and shined its headlights all over the front of the bus. This was not good as it would completely change the exposure I was going for. To make matters worse, I was getting changing light in the sky and my subsequent exposures would be shorter and shorter. Instead of trashing this exposure, I decided to incorporate the accidental intrusion and I used my flashlight to "paint" the rest of the bus to even out the exposure. This technique is called "painting with light" and deals with selectively illuminating portions of the image. When the exposure was finished, I was happy with the effect, but saw some things that I needed to do differently. Since I was now sold on the "painting" option, I was fine with a lesser exposure, as long as I could register some interest in the sky. On my third try, I came up with a version that I was pretty happy with in the review. I could make out the movement of the sky above, the bus was illuminated in a nice warm light which complemented the cool tones of the sky. In short, I was pretty sure that I had a winner. From this point on, I played with the lighting just to see if I could get something else that would work. Nothing else seemed to have the same pop as what was later to be called The Depressed Express. The title is not exactly a literal interpretation of the image and what it means to me. The title is a play on the situation more than anything. Looking at the markings on this bus, I could tell that it was a municipal transit bus back in its time. Its job was to get its passengers around the city quickly and efficiently. 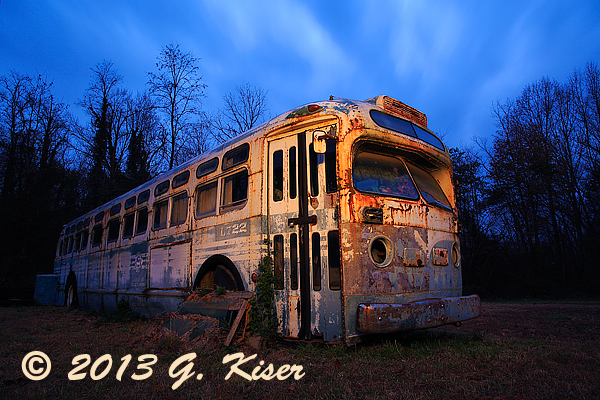 Now, some 50-60 years later, the bus is left out in a open area to rot. The fascia is dreary with missing headlights, faded and peeling paint, and the large areas of surface rust as well. 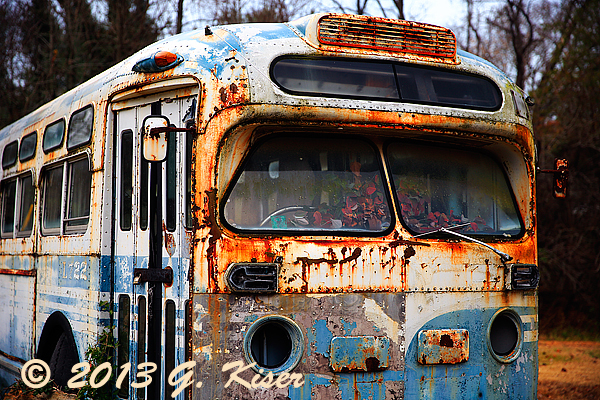 There is nothing happy about this bus, and none of its former glory remain. The windshield itself even appears to be looking upward with a plea of "take me now." As the sun came up, what was promised to be a mostly sunny day, turned out to be a most cloudy day...in fact there was a pretty solid overcast coming in. To add insult to injury, I was feeling drizzle on my head. I knew that I had one workable image at least, but I wanted something else from this bus before I gave up and called it a day. I went in close, and attached a polarizer to clear the windshield of glare and got a nice up close and personal image of the front of the bus. To me, this is the most interesting part of the whole vehicle. In addition to the weathered elements on the front of the bus, I also found the vegetation growing along the dash to be a solid testament to the length of time that this old bus had been sitting here. With the close up shot, that growth is readily visible, and therein lies the questions and mysteries that the photograph opens up. With the very intimate nature of this shot, you can almost reach out and feel the texture of the oxidized paint, the rusted rivets, and the flaking paint. There is just so much character here....I find myself getting lost in the composition every time I look at it.